We’ve had a few days of glorious sunny weather in Eugene, and even I peeled myself from my computer and spent some time outdoors. I’m still battling my ever-grossening pile of leaf litter from the city. 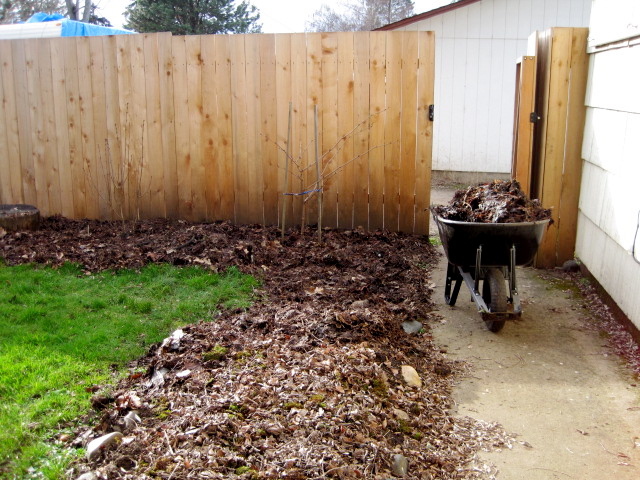 I had my first ever passive-aggressive discussion with a neighborhood suburban soccer mom type, who asked me what I was doing with the leaves. My response of “killing my lawn” was clearly not welcome, but she decided to back down with a “oh. Thank you,” instead of challenging the obviously deranged homeowner holding a pitchfork. American Gothic, indeed. The quality isn’t great, but they’re just fine for areas that I want to keep covered from weeds, like around my beds and landscaping. And I’m also hoping they’ll keep the roots warm of some of the more heat-loving plants. The tomato bed in the middle of the picture was already mulched with elm leaves earlier in the season, but I’m covering the area around the bed to discourage our infernal root-running grass from encroaching into the bed. I suppose I should just install a proper raised bed instead of a berm, but I rather like the half-moon shape of this bed. Northwest summer in January is a particularly cruel event, as February is usually the month we get freezing temperatures and snow. The daffodils are beginning to bud up, the hellebores are in full flower, and signs of growth are everywhere. We all, thus, pray for the freeze not to do too much damage to all the tender bits when it comes. I’m pleased to share with you my latest article for Eugene Weekly‘s Chow, a daring exposé of unusual local soups. OK, that may be stretching it, but the article includes a recipe (of sorts) by Chef Gabriel Gil of Rabbit Bistro. 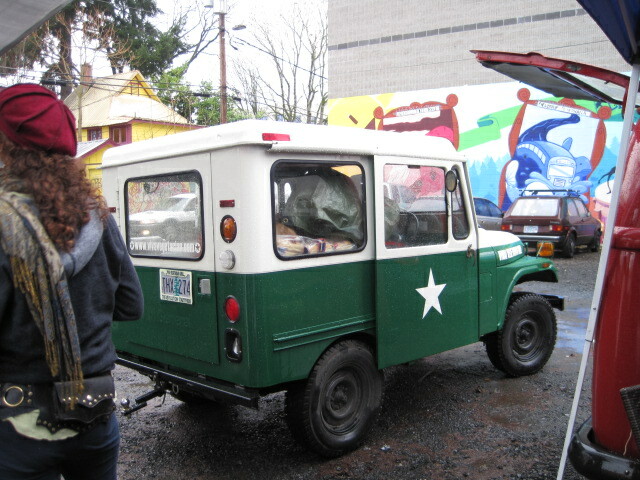 (See http://issuu.com/eugeneweekly/docs/chow-01-27-2011.) I love this glimpse into the mind of a master soup maker. 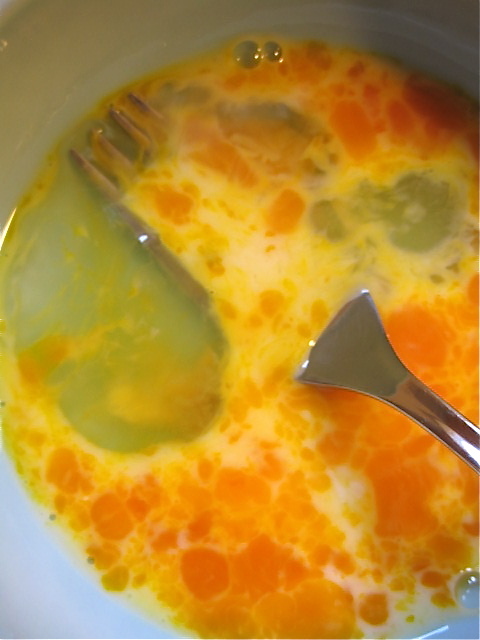 The recipe doesn’t provide a basic soup recipe; rather, it exposes his method for anyone who knows the basics of soupmaking and wants to refine and inspire their own technique. I’m sure some will be unhappy about the lack of specifics, but there are so many basic soup recipes for those who have never forayed into this important part of cooking, I’d advise you to experiment with anything you find that appeals, then come back to Gil’s method. The ingredients in the soup bowl above (image by Trask Bedortha of the Eugene Weekly) exemplify Gil’s creativity, and I’m sad we didn’t get the details in a caption. But I can tell you now: turnip, pork, and licorice. It’s a turnip purée with a porky broth, garnished with pieces of soft black licorice candy (!! ), maybe pimentón pepper? and chervil?, and chicharrones. The soup is infused with a hint of licorice that beautifully perks up the turnip, and as you’re musing on that, the pepper tingles your tongue. Using real licorice, instead of aniseed or Pernod or licorice root, is the whimsical surprise, and it really worked. And I’m not just saying this as a licorice lover. Or a turnip soup lover. 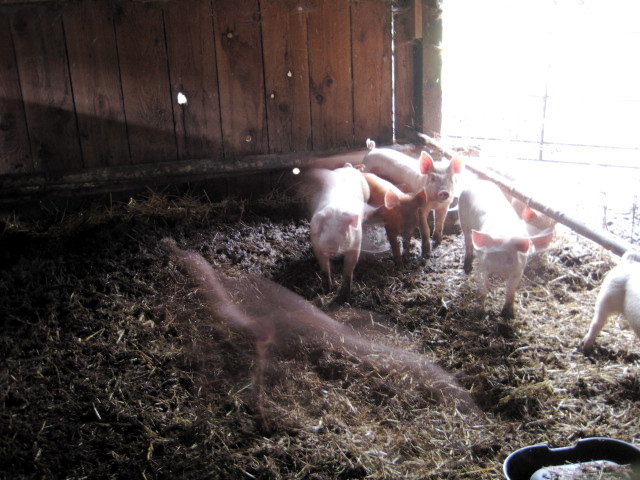 Or a pork…well, you get the picture. I’m only sad it’s gone. Be sure to check out the fab article on the Food for Thought radio program with Boris Wiedenfeld and Ryan Dawe-Stotz. I’m very glad Vanessa Salvia’s article on the Food Justice Conference made it in, as well. I couldn’t write about it because of conflict of interest (although I’m not sure why a free event would conflict anyone), and am glad she did it food justice. There are so many great food events upcoming in the next month or so in our little burg. I posted my lecture on Willy Wonka the other day, but here are a few more. One is tonight! Wednesday, Jan. 26, 7 p.m. If you like truffles or just want to check out gourmands in Eugene, you might enjoy the marketplace at the Oregon Truffle Festival. All events but the Marketplace are sold out. It’s $15 to get in/$20 with a wine glass, and you’ll see demos and taste truffled products. Thursday, Feb. 3, 4:00 p.m.
Feb. 19-21. 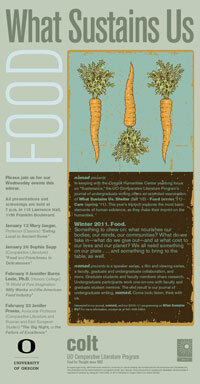 University of Oregon Food Justice Conference. This is a major interdisciplinary academic conference on food politics, featuring both local and national issues and speakers. There is also an art exhibition and a food fair. I’ll be writing more about these events soon, but urge you now to browse the program and save the dates! Interested in food and film? Join the Comparative Literature NOMAD mentorship program “What Sustains Us” lectures and film viewings, open to all. These programs are part of the year-long “Sustenance” series co-sponsored by the Oregon Humanities Center. Click the link for many more excellent public programs devoted to sustainability and other interpretations of sustenance. 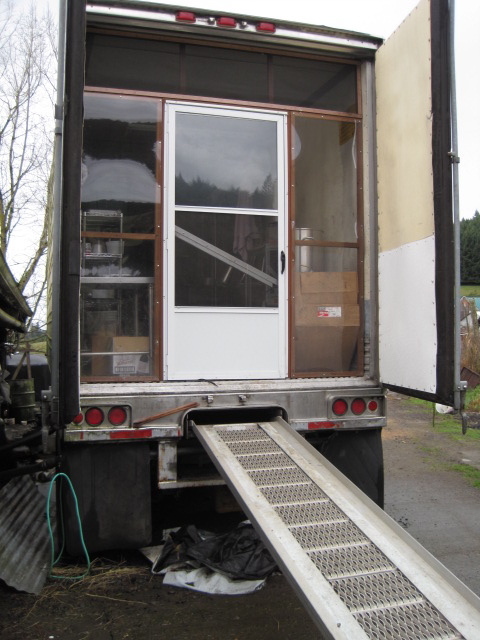 Open sesame! You will soon enter a land where normal, everyday things turn into objects of wonder and delight! We are moving into a land of both shadow and substance…the Fermentation Zone! OK, it’s really just a farm. But what a farm! 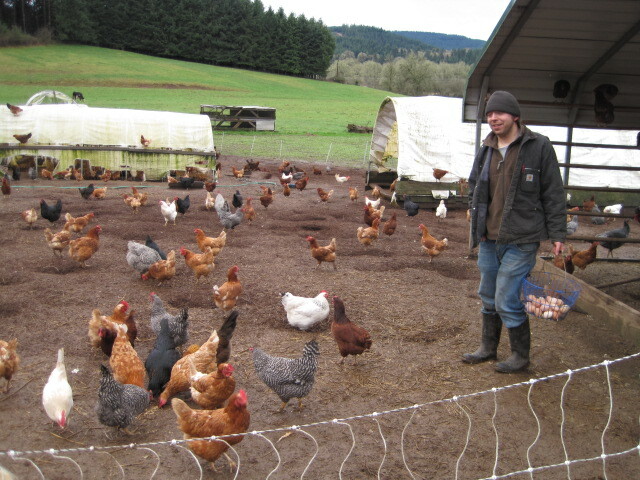 Laughing Stock farm, just south of Eugene, to be exact. They’ve supplied pork to some of the best restaurants on the West Coast for dozens of years, including Chez Panisse and Paley’s Place. 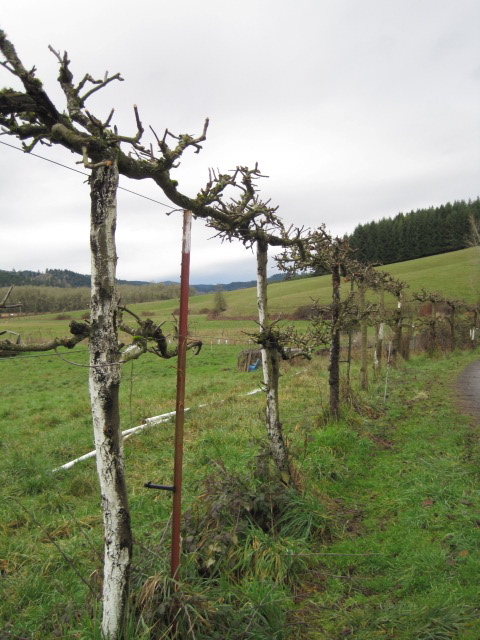 I had the most welcome opportunity to visit not only the piggies and chickchicks and remarkable line of almost a hundred myriad espaliered apple trees, but also the fermentation facilities that are being developed by owner Paul Atkinson and charcuterie force majeure Del Del Guercio. 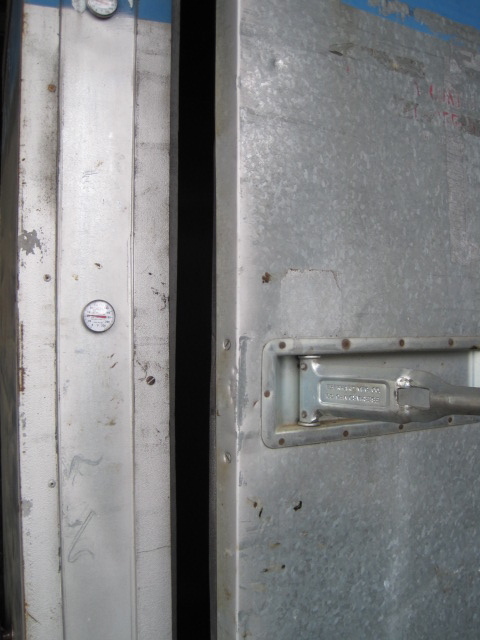 The massive metal door at the top of my post is the cold smoker Del developed. 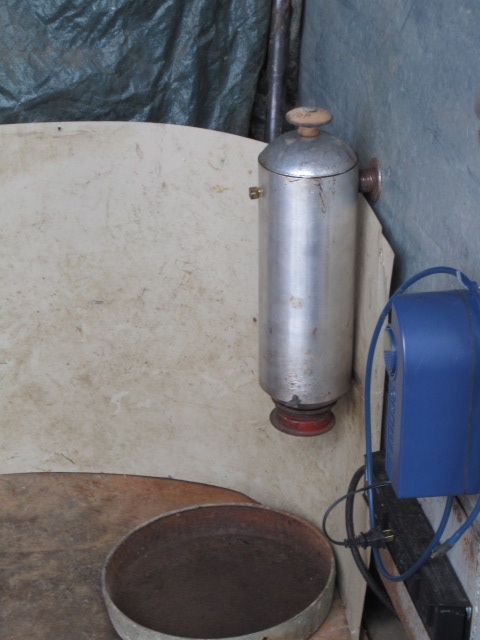 The picture above is the business end of the cold smoker. One puts a couple of handfuls of wood chips in this little container, and the smoke that results is enough to fill the chamber. I sampled some of the honey bacon trial this week, and even though Del feels it’s too smoky yet, I was deeply, immediately smitten. 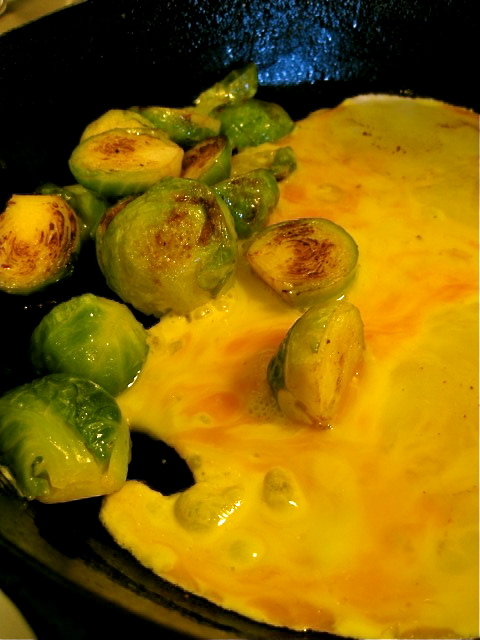 In fact, I’m thinking about it now and how sad I am that I gobbled the rest of it down with eggs this morning. This beauty is a work in progress. 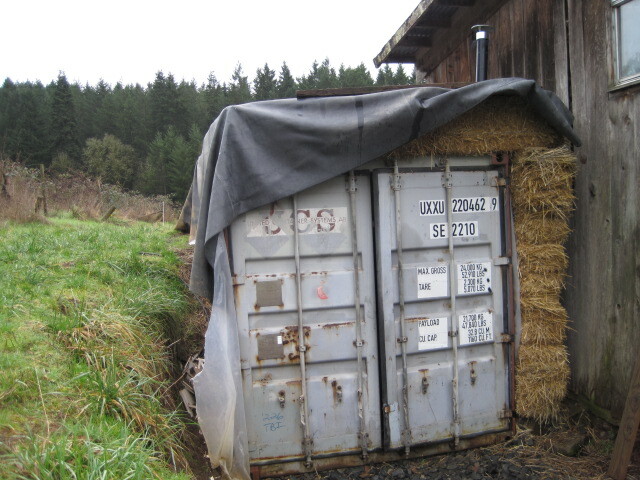 It’s an old shipping container that will, when finished, be mostly buried in the hill to the left. Inside the container, the walls are lined with fragrant cedar wood, and the humidity will keep curing meat at an even 70 degrees. This, my friends, when you consider the quality of Paul’s whey-fed pork and Del’s curing powers, is a several-ton old metal, asphalt and hay insulated slice of heaven. 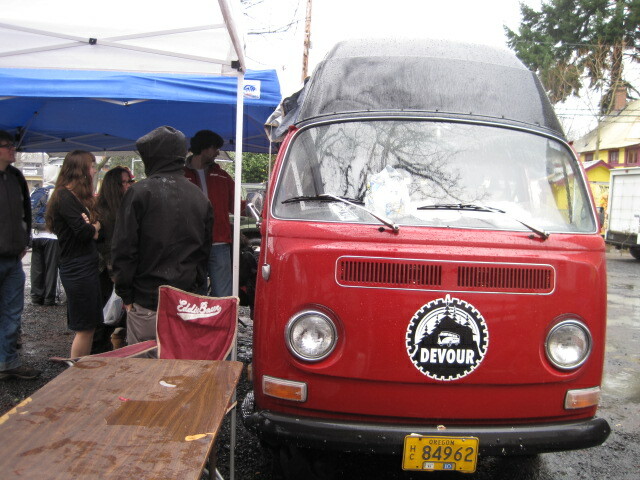 We also toured the brewery and cheese cave, namely, this converted semi truck. Inside, the interior is outfitted with a full sink and refrigeration to accommodate the cheese Paul makes for his own use (which is wonderful, unsurprisingly — we tried a goat feta and a couple of smoked cheeses). Del, who is an award-winning beer brewer, has his equipment set up — and I nosily noted a Pilsner recipe in a spiral-bound notebook — for his next batch. We ended the tour with samples of Del’s chorizo and Italian fennel sausage, plus the cheeses, and chatted with the farm assistant who we had met earlier collecting eggs, and a beagle we had met in a barn along the way. Could life get any better than this? 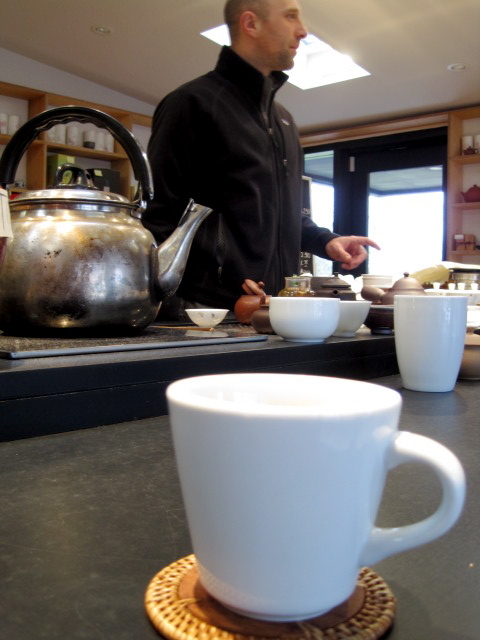 Del and Katie, Josh’s girlfriend and food writer, sampled a range of J-teas with me, each as unusual as it was delicious. It was a good reminder that I need to belly up to a tea bar every once in a while for serenity now. 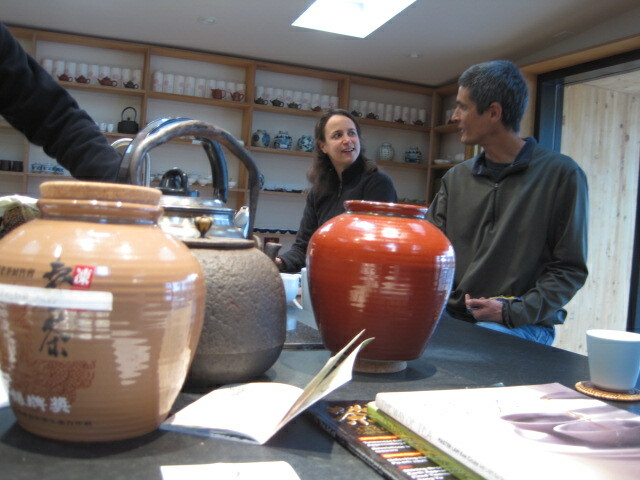 And even though the teas were Chinese and not made on a farm in the South Eugene hills, Josh showed off several tea vessels made of bona fide Willamette Valley clay, the stuff that drives all of us gardeners crazy when we hack away at it to plant our tender seedlings. 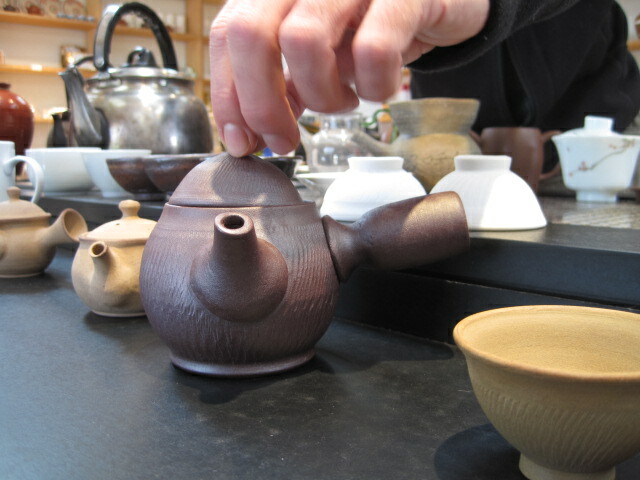 The teapot above is 100% local clay. The stuff cleans up nicely, don’t you think? What a great morning. Thanks, Del, Paul, Paul’s assistant whose name I can’t recall, Josh and Katie, for a wonderful trip. I managed to shoot a few photos at the Fun with Fermentation festival, held today at the W.O.W. Hall. 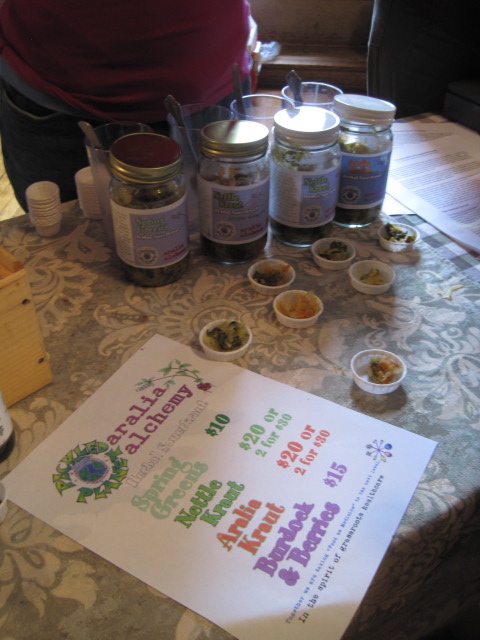 While folks did demos on fermentation techniques on the stage, a couple dozen vendors of fermented kraut, pickles, kimchi, bread, kombucha, beer, cider, and tea sampled their goodies as part of a fundraiser for the Willamette Valley Sustainable Foods Alliance. I was enamored of these dee-lux kraut pounders, on sale for a pretty reasonable $25, since it’s hard to find anything else to do the job. And check out these little cubes of pillowy quinoa tempeh. Someone (edited to add: 8…9…Tempeh? See comments) has been experimenting with different grains, fermenting what is usually only soybeans into tempeh. The crumbs in the middle of the photo are the remains of a pinto bean tempeh. 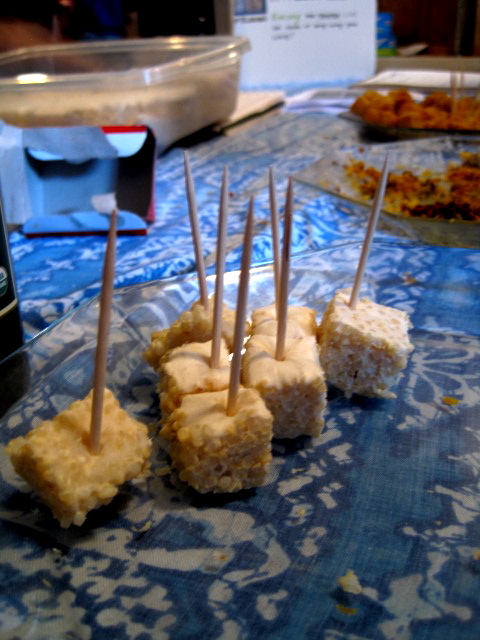 The quinoa tempeh cubes were also served deep-fried in coconut oil (far right). I was pretty impressed by the texture and flavor. 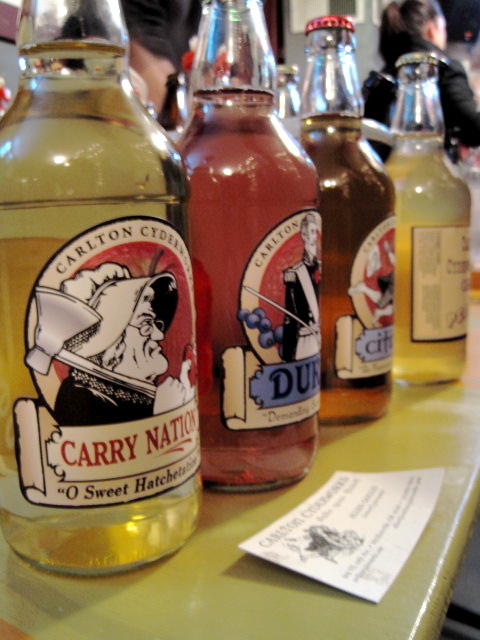 Of the fermented products on display, the most common were kombucha and sauerkraut. I’ve never really understood the kombucha craze, since it seems very expensive in the stores, but I liked the flavor of an elderberry kombucha at one of the booths — it was like a more nuanced, developed shrub (an old-fashioned drink of soda and vinegar). 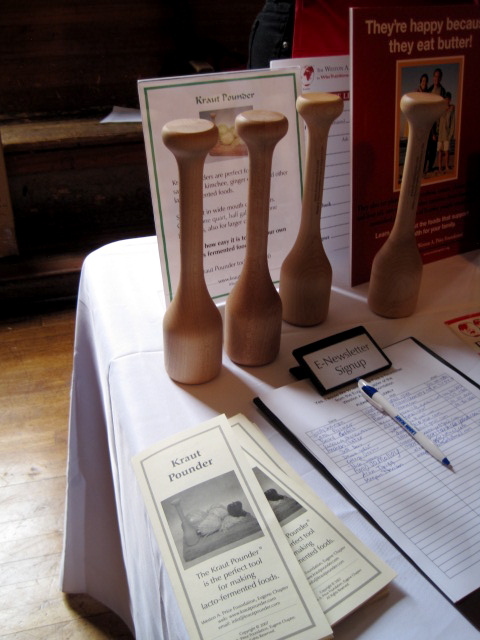 Several vendors were on hand to show off their sauerkraut. Honestly, I wasn’t super impressed by the canning techniques or flavored kraut. Store-bought hippie-style kraut always seems to be dry and kind of dead or undeveloped tasting to me, and some products on hand were mushy, which usually means the kraut is aged to much or maybe boiled instead of low-temp pasteurized). Aralia Alchemy, a small business that markets their krauts through Pickled Planet (but doesn’t seem to be on their website), offered by far the most unusual offerings. I don’t know how I would eat a jar of Aralia kraut, since I usually cook mine, but if you like eating it raw, it would be a wonderful addition to your repertoire. Jennifer McCoy, a certified herbalist and owner of Aralia Alchemy, told me she wanted to add spring nettles to her cabbage, and the experimentation began. At the festival, she was sampling two kinds of nettle kraut, one with whole small dandelion heads, and another with aralia, a leaf that looks a bit like cooked collards in the kraut, but has an unusual flavor. Jennifer said it was like ginger, but not any ginger I know. Very worth a try, if you should find a way to get it. Probably the best plain kraut at the festival was Good Food Easy’s kraut (and I enjoyed a delicious sample of radish kimchi, too). And I hope we convinced another popular local vendor to sell their yummy 6-week-aged kraut, which they were sampling alongside their regular stuff (which is only aged a week, and is sweet instead of sour). After all that hard work, I was very happy when I heard my friends had already put in the Devour brats-with-kraut order when I made my tipsy way upstairs. We went outside in the rain, and, as much as we wanted an order of beignets, feasted our eyes instead on the red VW bus and Viva Vegetarian’s cool, forest green ex-postal jeep.